Another great meme worth passing along. 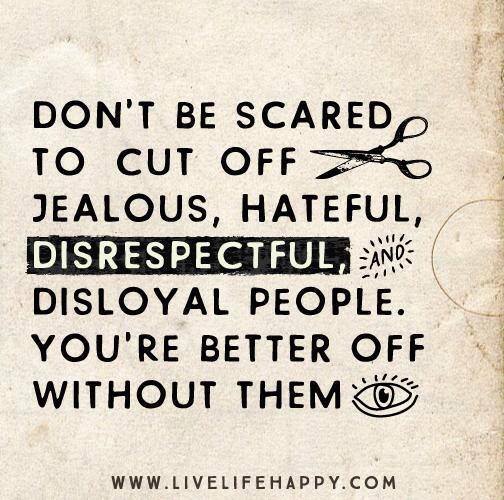 The simple point that this is making is that if you’re getting negative people treating you like crap, don’t be afraid to cut them off. Remove them from your life. If you’re getting people always hating on ya and disrespecting ya, you don’t need to deal with them. I do this all the time and it works. People treat you like garbage, just pretend they’re dead. They’ll leave you alone once they realize you don’t care what they have to say. You know who your true friends and supporters are when they show you love, respect, support and friendship. They don’t waste a lot of time hating on you. Trust me, I do have plenty of people who really care and stay pretty loyal to me. I’ve got family, fans, supporters and people from Greenwich who are actually pretty caring. Just because one person says you’re a bad person doesn’t necessarily mean everyone else will agree. If people wanna have negative and hateful opinions about you, just let ’em have at it. Just keep living life and keep being happy.